When Nokia officially took over the Withings brand in 2017, it inherited many of its products, like the Activité watches, the WiFi Body scales and a wireless blood pressure monitor (that was relaunched as the Nokia BPM+). The one product it didn't carry over was the Aura, a combination lamp and bed sensor designed to track your sleep patterns and shine various shades of light to help you sleep or wake up. Nokia discontinued it, much to the consternation of many Aura users at the time. Be the first to review the Sleep? 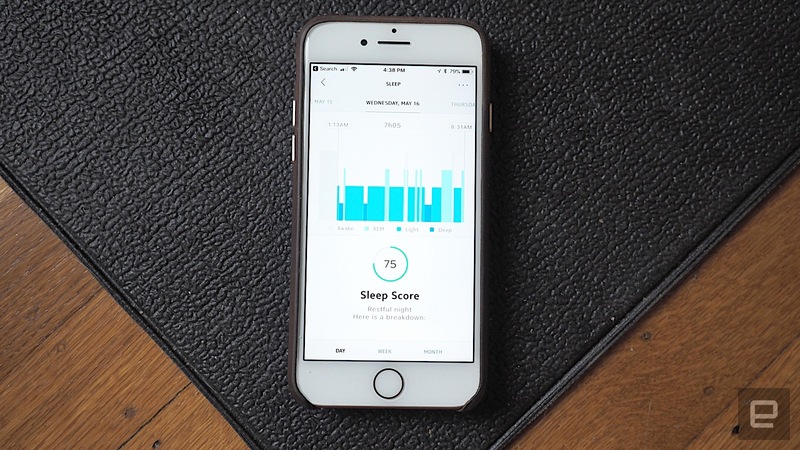 In early 2018, however, Nokia revealed what is essentially the Aura's replacement: The Nokia Sleep. It's similar to the Aura, except it no longer has that aforementioned lamp. Instead, the Sleep supports IFTTT, a toolkit that lets two or more connected devices interact in simple ways. For example, you could have IFTTT set to turn off the lights when you get in bed or increase the temperature on your thermostat when you get up. The device's full name is actually "Nokia Sleep and Home Automation Sensor," indicating that the smart home feature is one of its main selling points. Which sounds good in theory, but as I would soon find out, it falls short. Not only is the IFTTT integration a little buggy, it doesn't really add a whole lot to the experience. While most sleep trackers are worn on the wrist, Nokia Sleep is a soft rectangular pad which you slide underneath your mattress. Setting it up is as easy as doing just that, making sure it's aligned roughly around your chest level when you're lying down. 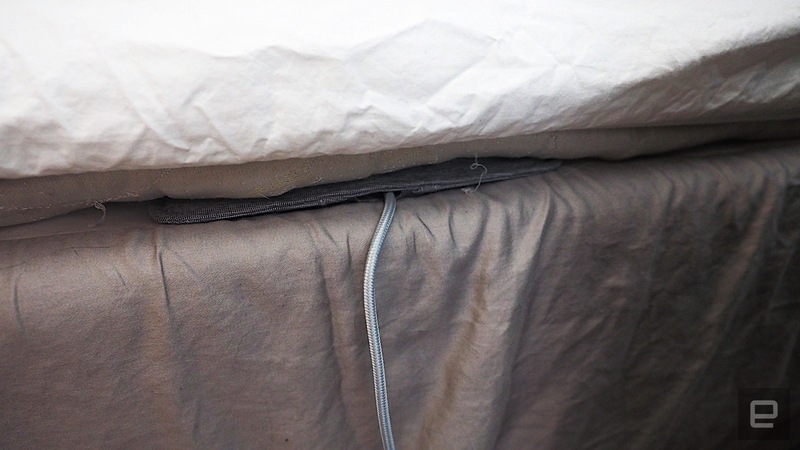 The only thing you want sticking out from the bed is the power cable. I already had the Health Mate app installed on my phone, which is what you need to pair with the Sleep. I selected "Install a device" in the app, chose the Nokia Sleep and it walked me through the installation process. Then it went through a calibration process where the Sleep pad makes a whirring noise for around 10 minutes, which Nokia says is the device essentially doing a reset. You're not supposed to disturb the pad for that length of time either, so I'd recommend not trying to set up the Sleep sensor right when you're about to go to bed. For as long as I can remember, I've had terrible sleep habits. I used to stay up late watching cartoons as a child, only to be rudely awoken hours later as I was dragged out of bed to go to school. This pattern has followed me throughout most of my adult life (except I've replaced Voltron with Bob's Burgers), and though I've corrected some of this behavior over the years by going to bed earlier and cutting back on coffee, I occasionally revert back to my night owl ways when I'm stressed or have deadlines to meet. I've tried wrist-worn sleep trackers, but I find them uncomfortable. So I was actually pretty interested to see if the Sleep would do anything for me. One of the first things I did was try to use IFTTT to connect the Sleep sensor with my Philips Hue lights (in my bedroom). 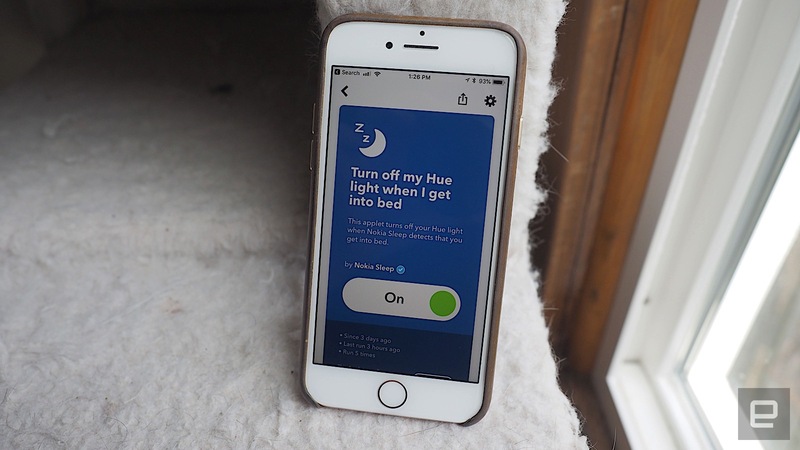 One of the pre-made Sleep "applets" (a tiny program that only performs one or two functions) on the IFTTT site turns off Hue lights whenever you get in bed. Perfect, I thought. So I turned it on, connected my Philips and Nokia accounts and, uh, laid down. And then nothing. At first, I thought the Sleep sensor wasn't working, so I nodded off as usual. When I checked the app the next morning, however, I noticed it had tracked my sleep patterns, indicating the Sleep sensor was fine. For days, I puzzled over this problem, especially since this was supposedly the Nokia Sleep's defining feature. Nokia support wasn't much help either. Then I happened across a Reddit forum that suggested the start and end times might be an issue. I changed the start and end times to "none" -- basically forcing the applet to work at any time of day -- and finally, it worked. It still took at a couple of minutes -- not the "few seconds" that was promised -- but it did work. According to Nokia, this was potentially a "time zone" bug, but the company didn't really have any other explanation beyond that. I tried several other IFTTT applets, like triggering a Google spreadsheet to log whenever I went to bed, and getting the Hue lights to glow in a "Spring blossom" (pinkish) tone whenever I got up -- and they worked as intended. I also tested out the Sleep sensor with an Amazon Echo Spot, which doesn't need an IFTTT integration. I could ask questions like "Alexa, ask Nokia how I slept last night" and it would tell me if I had a good or bad night of sleep. Yet, I'm not convinced these integrations are very useful. After all, I can just as easily turn the lights off without the Sleep sensor -- since Hue is Homekit-compatible, I can actually just tell my phone "Hey Siri, good night." Plus, I often like leaving the lights on so I can read in bed. And instead of asking the Echo what my sleep patterns are, it's far easier to just look at the app. I'd prefer the Nokia Sleep to turn the lights on and off depending on where I am in the sleep cycle. If it could slowly dim the lights when it senses I'm falling asleep, or work with a smart speaker so that it'll play me a lullaby. Or maybe it could slowly brighten up the room or play a peppy tune when it's time to wake up. After all, studies have shown that it's best for the alarm to go off during the lighter sleep stages so that you wake up more rested. That is, if the Nokia Sleep had an alarm at all. Which it doesn't. Considering the Aura did, and Nokia's own Activité watch has one too, the fact that the Sleep doesn't have one at all seems like an oversight. No, the Sleep itself doesn't have a speaker, but Nokia could've added some kind of alarm functionality so that it'd work with the aforementioned IFTTT-connected smart home devices. 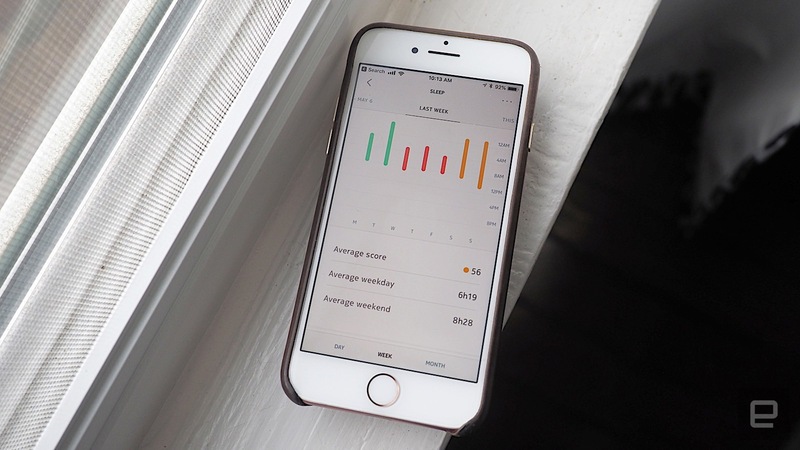 Practically every other sleep tracker on the market has an alarm. A lot of sleep-tracking apps have an alarm. But, for some reason, the Nokia Sleep doesn't. Even as a sleep tracker, the Nokia Sleep isn't perfect. Like others, it tracks sleep patterns, showing the periods in which I'm in light, deep or REM sleep. The app gave me stats like duration of sleep, how long it took to drift off, how many interruptions I had during the night, as well as my overall sleeping heart rate. Each night is also given a Sleep Score, where the higher the score, the better sleep I had. But the sensor can be a little hit or miss. For example, it sometimes counted the time I spent watching YouTube or reading a book as me sleeping, when I was obviously awake. It also doesn't always take into account when I get up from bed to use the bathroom, thinking that I had a full night of sleep when I didn't. Another nitpick is that when I took the occasional afternoon nap on the weekends, it bundles that sleep time in with the rest of the whole day, thus skewing the sleep score for that night. But that's not too different from what you can already get from other sleep gadgets. What really set the Nokia Sleep apart from everything else was the smart home and IFTTT integration. And that experience, to me at least, was decidedly underwhelming and certainly not worth the Sleep's $100 retail price. Plus, it's unclear just how long the product will be supported. A few weeks ago, Nokia announced that it would be selling its Digital Health division back to Withings co-founder Eric Carreel, which leaves the future of Nokia's health products very much in doubt. The company has promised to provide assistance for these devices beyond the sale, but it remains uncertain just how long that will be. Whether or not the business survives though, I'd advise against the Sleep. 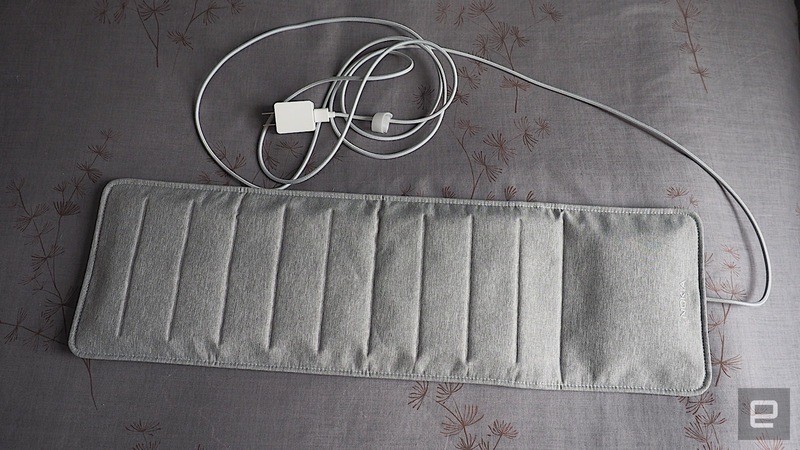 In the end, it's just like any other sleep-tracking gadget, and maybe even a little bit worse. Which is a shame, because given Nokia's history with the Aura and other sleep trackers like the Activité, the Sleep could've been really great. But missteps like the lack of an alarm and poor smart home implementation makes the Sleep a missed opportunity. Just like Nokia's Withings purchase, the Sleep ended up a disappointment.